Hi, I’m Helen Colllins “From The Little Room Interiors”. I’m pleased to give an insight for ICM Geelong about cabinetmaking and interior trends. Growing up in the country with a father who was the local builder and “Jack of all trades” (his name was Jack, too), then marrying a cabinetmaker who worked his way to becoming a Master Builder with our own construction company at one time, I have always been involved in construction, renovation and therefore, design. Having only ever been employed in administration, but not finding that very rewarding, I studied to get my formal qualifications as an Interior Designer. Whilst studying for my Diploma I have been working part-time retail at both Higheight Home & Living, Inverleigh and Bayside Furniture, Geelong West assisting customers in their purchase choices of homewares and furniture. In between this, there has been a kitchen renovation for ourselves and I also developed a scheme and project managed a renovation for a client who updated their home. From the Little Room Interiors has come to life through my aim to work to make beautiful and functional spaces for people to live in. I am able to provide an overall scheme that I can project manage, source new product and materials, up-cycle existing items, suggest creative budget solutions or just assist in product and colour selections. A cabinet makers job includes the design, manufacture and installation of wooden items including stand alone furniture but also built in items like kitchen cupboards, laundry cupboards, wardrobes and book shelves. Often a cabinet maker will design a unique piece using a computer program, then after consultation with the client, will use specialised woodworking machines to create the piece. They must ensure the job fits perfectly and looks just right, so they must have a very high attention to detail. They need to understand design and furniture trends which means they can select the right accessories like handles and finishes to complete the look….. with a little help from people like me, too, of course. A cabinetmakers job is much more specialised than a carpenter’s job even through both involve working with wood. Choosing a cabinetmaker for your job is very important, as what they create for you should last for many years and be both practical and good looking. 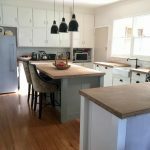 This is my kitchen renovation which incorporated existing cabinetry, which I painted, and new cabinetry plus a large island bench. I had bamboo benchtops custom made. Gone are the days when kitchens were a dark, closed off room, away from the rest of the house, where the woman was isolated to cook all day. These days kitchens in Australia are open plan, usually with large island benches, making a casual meal space and they are the domain of the entire family. Many modern homes will feature the kitchen space as the hub of the living areas. Some will continue this theme outside, with an outdoor kitchen featuring as the centrepiece in the entertaining space. Australia is lucky to have a little more space and if we’re combining rooms, it’s for design and entertaining. The Aussie indoor-outdoor lifestyle means that we’re world leaders in kitchen design. Australians need kitchens that are easy to clean, have lots of room for components like fridges and cooking appliances, but at the same time, are clever about the use of space, where a good designer and cabinetmaker come into their own. The materials used in Australian kitchens often mirror those used in Europe and North America and it’s easy to see the influence these cultures have in our homes. Australians use these influences to create a complete new style for our unique way of life. Our natural environment also plays a large part in influencing the colour schemes and layout for our renovations and new kitchens alike. People often think of kitchens as only a place to cook, but these days the Australian kitchen really is the centre of entertaining and family life. “The heart of the home”, today the kitchen tops the wish list for renovating. A modern designed kitchen is one of the most highly sought after attributes by buyers in today’s real estate market. With that in mind, a clean and unembellished design, using minimalist colours and materials are your best bet for resale value, but as I have done, incorporating a “wow” feature, such as this custom made barn door, will be of benefit. The cabinets, appliances and bench tops are the standout feature of a kitchen and therefore, choosing an overall style with a complimentary mix of materials for these three big players will ensure you are on a winner. Whether you’re opting for a sleek black and white decor, or a more natural wood finish, a modern kitchen is nothing without quality cabinetry. Kitchen bench tops are not only highly visible, they are also highly used, so choosing a quality bench top that is both durable and visually aesthetic is an essential part of any modern kitchen design, think stone, composite, marble, timber or bamboo. Modern kitchens are renowned for high quality appliances. Stainless steel is a popular choice and will suit just about any kitchen design, but if going for colour, ensure it is still a classic, for example, black or white. Technology is now part of our daily functioning and so your cabinets can play a whole new role these days. A cabinet with a built-in charging station or storage for a laptop can allow you to enjoy the convenience that will be appreciated every day. I have had one incorporated into my island bench. So really a cabinetmaker has the expertise and ability to produce any type of cabinetry needed to fit into your home. Whether you are looking for a statement piece, a floating bench and breakfast bar, or to add some much needed storage. All in all, lucky for me I married a cabinetmaker and have been able to get my own bespoke kitchen and seen my design ideas become reality. Lots of love’s gone into this Surf Coast home. At Independent Cabinet Makers Geelong our purpose is to help you find a great local cabinet maker.